Modern Times, curated by art historian Zeynep Yasa Yaman, exposes a critical perspective on art history—an academic discipline, primarily concerned with the traditional conception of art in which its history is seen spatially, as a panorama of a universal evolution. In this interview, conducted by Rumeysa Kiger, Zeynep Yasa Yaman explains the structure of Modern Times by elaborating on the idea behind the exhibition as well as the processes of selection, combination, and presentation of the works in the exhibition space at SALT. When one speaks of the history of modern art, s/he has come to accept written history, not lived history, as the frame of reference. The exhibition does not deal with art history and modernization in terms of continuity and influences. It rather focuses on the time and the spirit of the time in the first half of the twentieth century. It avoids tracing certain parallels among the works from both Turkey and the West, and attempts to reveal how an idea is adapted to different contexts. In this way, the exhibition emphasizes the co-existence of ‘other’ actors that have been influential in forming the spirit of the time, yet not recognized by the narrative of art history. Accordingly, the exhibition attempts to figure out the artistic practices within the framework of their specific conditions in which they emerged and developed. Thus, it displays the works from Turkey in terms of the social, economic and political conjuncture corresponding to a process of modernization. Rumeysa Kiger: This exhibition was designed as the third part in a series of exhibitions that display art works from Turkey side by side to works from the Van Abbemuseum’s collection, all from the beginning of the 20th century to the 60s. Although the first two exhibitions followed the exact same logic, seeing a simultaneity in the beginning of the century is quite interesting as we are accustomed a discourse of lagging behind the West and learning from them, especially in the field of the plastic arts. I think what you are doing with this selection is to show the contrary. I’m curious about your thoughts as an art historian on this period. Zeynep Yasa Yaman: Various geographies following each other, impacting each other, and sharing worldly knowledge is a phenomenon that has been experienced since forever. The modernization that has been continuing since the Ottoman Empire was experienced in Turkey under its own set of specific conditions. The understanding of the relationship between art and the state being a necessity of civilization was one of the issues that was extensively discussed in the early period of the Republic of Turkey. Until Ataturk’s death, various educational, administrative, cultural, and art spaces, institutions, and activities had been established in the modern capital, Ankara—projects had been realized. Starting in 1921, in Turkish Houses [Türk Ocakları] and Community Houses in Ankara and Istanbul, exhibitions had been opened at the appropriate spaces of institutional buildings, efforts to form collections were continued and different perspectives on art were discussed. Art in Europe, USSR and the USA had been closely followed, paying particular attention to the arts and culture in France, and “art” had become an important tool of cultural practices. The faith and need in the power of the arts for the construction of the Turkish identity bore two different perspectives of art. The first was the representation of “Independence War and Reforms” using the media of painting, sculpture, and film, which would be presented to and etched in the visual memory of the society. The second was an impulse to express the vision and mission in allegiance with ideals of a nation-state using a new art and formal language. The canonization of art history that is filled with criticisms founded on the discourse of “following the West” or rather “lagging behind the West” is actually an imposition of the West and has been accepted by artists as well. The government has frequently wanted to show modern art from Turkey in exhibitions abroad, in Europe, but has encountered oppositions based on “this has been done here before.” European museums that ignored the periphery, the outside and the East, filled up with works that has been produced by Europe itself until 1950s, focused on exhibiting the progressive level that was achieved. The art by those who have been condemned to be insufficient while reaching this level was disregarded and was assessed in a Europe-centered perspective rather than its own specific context. This understanding also surrounded the art world in Turkey and after each exhibition, the “lagging behind” was re-assessed, wondering what went wrong. Innovation is invented in a geography by specific people and groups and then shared with others. Although this reality is understandable within the context of Europe, for those outside of the center, it was seen as an “insufficiency.” I’m not sure if such a discussion was taking place in Europe at the time. (Today, the modern’s referential and “other” culture is being discussed, of course.) When Picasso was inspired by African masks and Matisse was inspired by Islamic art and calligraphy in Modern Europe, they were considered unique as their inspirations stemmed from those who were “behind” and they moved forward on a new path with this impact; both were recorded in modern art history as pioneers. For example, the subject of “Bathers,” an irrevocable subject for the artists at the time, entered European painting through Ingres’s Turkish Bath fantasy. The idea of women, naked in the identity of the goddess was given up right around this time. In other words, real nakedness emerges. Cézanne’s “Bathers” are not at all natural in terms of content, tens of naked people in open air, next to a village… Manet’s “Olympia” (with mythological references in its title rather than in the body), “Dejeuner sur l’herbe” are as such as well. There are many examples. Manet’s naked women being scandalous is quite surprising. French artists frequently depicted the naked body in their painting tradition, which was transformed in the modern times as the “naked” was fleshed out in their own cultural environment; the women were represented as the women in their own society rather than women of the east, triggering protests. The previous was not considered scandalous. In conclusion, the exhibition does not focus on “we were not going backwards in the 20s, 30s, 40s, and 50s”. Rather, the focus is on the time and the spirit of the time. It takes time for an innovation to be assimilated, internalized. I don’t understand why “cubism” is beaten up for having entered this country later? The Ottoman Empire’s intellectuals were aware of artistic movements in the first quarter of the 20th century as well as of Picasso, but they felt an affinity only towards some. This is the case for Europe’s periphery and even for part of Europe itself. The actors in modern art were so few that they could be counted by one hand and they were ostracized by the art circles until they became canonized. For example, Musée d’Art moderne de la Ville de Paris was designed in 1937 as the International Art and Technology Museum and in 1961, it opened with a small modern art collection from Petit Palais in 1961. Alfred H. Barr, Jr., the director of MoMA, which opened in 1929, organized the sensational Van Gogh exhibition in 1935. The Tretyakov Gallery started to show contemporary art in 1985. Sergei Schukin and Ivan Morozov’s collections of Impressionist and post-Impressionist, modern works were donated to the Hermitage Museum in 1948. Let me stop here. Istanbul Painting and Sculpture Museum that was established in 1937 and handed over to the Fine Arts Academy was a contemporaneous institution, in a way, but did not succeed in becoming a museum. RK: Could we say that there was a parallel between the perception and interpretation of the political and cultural modernization in Turkey and the places where the works come from? Or rather, what could be deduced in this sense from the works in the exhibition? ZYY: Charlie Chaplin’s film Modern Times, in which he described the tragicomic state of a laborer who had lost his mind because of the Fordist system in the 1930s, is from 1936, which is the year that the Van Abbemuseum was established. The world was in a craze of “modernization/mechanization.” The same applied to Turkey. This issue was frequently brought up and discussed in periodicals and newspapers published in Turkey. The Yeni Adam [New Man] magazines were selected for the exhibition for clearly showing this situation. We also wanted to show El Lissitzky’s USSR Im Bau (USSR in Construction) Illustrated Magazine, but as the museum is preparing an exhibition on the artist’s work, we couldn’t borrow these magazines. Walter Benjamin advised to read the most spiritual cultural products alongside with the same culture’s regular, cheap, worldly products; I can say that I followed a similar method. With one difference—I brought together works that were in a museum collection in The Netherlands with works that were in private collections in Turkey, as well as works that were glorified over time or completely disregarded. To “look awry” enables identifications of idiosyncracies that are usually missed by a proper academic perspective. An exact parallel does not exist anywhere in the world. Thus, for me, what mattered was not how thoughts were made the same, but rather how they were comprehended, interpreted, utilized, and localized—figuring out the correspondences was important. But if we approach this question from the perspective of your question, I can say that a formal—not content—parallelism can be seen between Turkey and Europe in the 1950s. Furthermore, abstract art in the 1950s in Europe and the USA, also is somewhat similar in form, yet, differ quite significantly in terms of the thoughts, content, and approach. The shared denominator was the production of a formalist art that would not be servile to ideologies and that would oppose the pre-determined, militarist art of World War II. This is a political position in a different sense. Another phenomenon that was important for the art world in Turkey in the 1950s, is the artistic sensibility that problematized the East-West synthesis. This perspective was embraced by the Fine Arts Academy and differentiates itself from the Turkish-Islamic synthesis foregrounded by the art in the early period of the Republic of Turkey. Ziya Gökalp’s Türkleşmek, İslâmlaşmak, Muasırlaşmak [Becoming Turkish, Muslim, Contemporary] brought up these opinions in a different form. Nurullah Berk’s paintings in the exhibition are similar in form to Fernand Léger’s but their contents are completely different. Nejad Devrim, who is included in the Paris School, conceals a similar integrity of meaning. 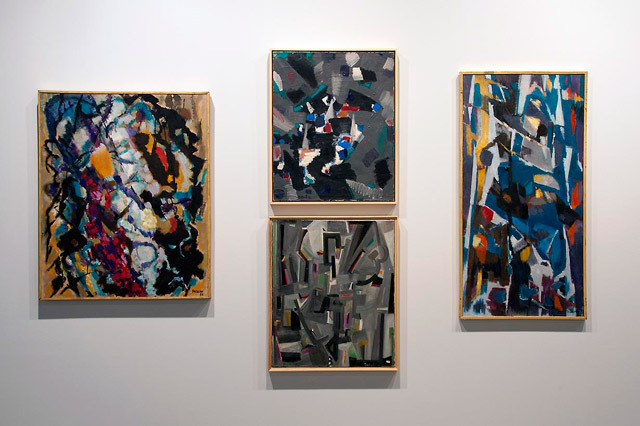 For the exhibition, who influenced who (for contemporaneous works) and formal similarities, are secondary to the cultural codes that are added to and interrogates the collective consciousness—some of the works were done before the European abstractions, for example. Thus, instead of having the works confront each other, we preferred to hang them side by side for the exhibition. Another detail that I would like to highlight is the side-by-sideness in the display of this exhibition is beyond the intimacy that is produced in the space; rather, the point is that no matter what, these works already have an affinity with each other. The recognition of the “moderns,” the reactions, happened during the Salons in which everything was displayed on top of each other. I wanted to avoid the “one work per wall” understanding that directs the perspective onto itself, in which the exhibited becomes sterile and [singular]. Of course, the exhibition attitude is similar to a Modern Times exhibition, in which works are displayed side by side, without touching each other, making what is next to them “other,” rather than a Salon sensibility. I worked from an acceptance of the looks that are side by side, moving backwards, which could trigger re-thinking. RK: Could you talk a bit about the process of selection? You had the works from Van Abbemuseum and did you then combine these with works from Turkey? Could you elaborate on the affinities with examples? ZYY: As you mentioned, we had the works from Van Abbemuseum. Starting with the accumulation from Van Abbemuseum was a method that SALT had previously employed in the two preceding exhibitions. For the Modern Times exhibition, the same principle was observed. SALT’s institutional identity is different; it’s not a museum, it does not have an art collection; its mission is not directed towards this anyways. As such, Van Abbemuseum’s collection forming the backbone was accepted at the beginning. Van Abbemuseum is not rich with modern art works; the collection is focused more on contemporary art and provides an important development as such. The perspective had to be delineated around the years 1920-1960, based on the selections from the collection. First, the works in Van Abbemuseum’s collection that could be juxtaposed and get in a dialogue with artistic production from Turkey were selected. The important thing here was to make a decision on what kind of relationships would be established between the Van Abbemuseum and modern art from Turkey. Van Abbemuseum’s collection was most probably representative of the founder Henri Jacob van Abbe, who started his business by producing cigars; Van Abbe’s tastes presented a European choice—this is quite important. The collection includes works from The Netherlands, Belgium, Poland, USSR, and France. I’m not quite certain about what kinds of preferences and projections were made while forming the collection, maybe this has already been researched. But the collection does not provide us with a depository that is sufficient to represent the modern art history in the period 1920-1960 in the way we are accustomed to; the exhibition is thus not that concerned with “representation.” Modern Times is thus not a monolithic modern art exhibition, but it is an exhibition of art history. If we are to return to the beginning, when working with what is at hand, the juxtaposition of works from the collection with modernization practices in Turkey, became an issue/problem that needed to be scrutinized. I formulated a perspective on this question, but it was challenging to borrow works short-term both from the Van Abbemuseum collection and the museum and private collections in Turkey. For example, El Lissitsky’s works could not be borrowed as the museum I mentioned previously was working on an extensive exhibition of the artist. In the exhibition, important “modern artists” such as Picasso and Braque are also included. But for me, what was important was not the allure that these names would create, but rather the co-existence of “other” actors that defined the spirit of the time more specifically and who were under-recognized. They were defining for the ability to move. There were many works by CoBra artists in the museum, but very few were used. This exhibition is not based on differentiations nor on similarities. This concern or what the situation of contemporaneity, distant from the questions at hand, was more important. Rather than starting with the museum collection to have a straight-forward perspective that battled masterpieces, triggering conversations on who impacted who or highlighting resemblances (There are similarities. These similarities could be seen without looking at works from Turkey. ), the idea was to foreground similar ways of thinking and production. The works from this period were not seen from the perspective of a traditional art historical canonization nor a perception of art history delineated by rich collections. Historical prejudices, provided and memorized, were stepped out of; efforts were not made to support this period with a hypothesis nor to gather information to support this hypothesis. This was not because this information did not exist, but rather because, it was not preferred. Or maybe I should say, the effort was employed to show different perspectives on modernity. A calm, uncompetitive, problematique-driven exhibition. RK: Written and visual documents are used alongside paintings and sculptures. How do you think these documents complement the works? ZYY: To realize an exhibition such as Modern Times with all its variables, visually and conceptually, is quite challenging in terms of space, time, and costs. SALT’s exhibition space provided the conditions of a museum, but is limited to the space in Galata. Van Abbe strongly emphasized the physical and technical conditions of the space in which especially the early works would be exhibited. As such, it became even more important to display periodicals and films of the time to further contextualize the works in the exhibition. Two important films that were directed towards relaying the political opinions of the time, made visible two periods in the history of Turkey visible—early period of the Republic of Turkey and the 1950s when the Democratic Party was in power. Türkiye’nin Kalbi Ankara [Turkey’s Heart, Ankara] was commissioned by Atatürk from the USSR in 1933 to celebrate the tenth anniversary of the Republic of Turkey. 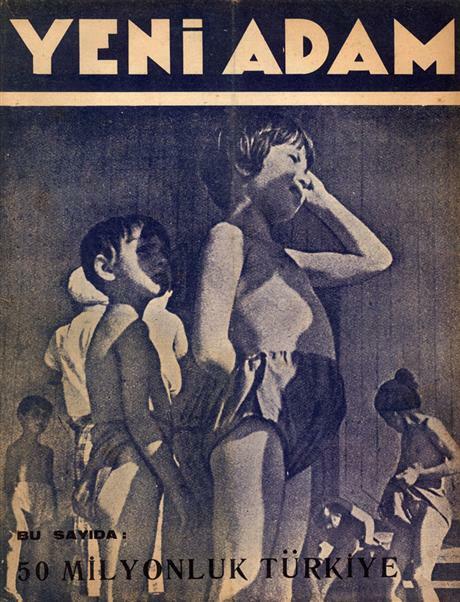 Abidin Dino meets Yutkeviç because of this film and goes to USSR in 1934 to study film, where he stayed for three years. He works with Yutkeviç and Eisenstein on anything and everything related to cinema, ranging from make-up, décor, stage direction to screenwriting. He works on Yutkeviç’s Madenciler [Mine Workers]. İstanbul’un Fethi [Istanbul’s Conquest] from 1951 is the first historical film that sheds light on the celebration of the 500th anniversary of the conquest of Istanbul, East-West, Turk-Islam synthesis, a high-budget production supported by the government and the military—the Ottoman Empire’s presentation of the East focuses on the “Byzantine” in its representation of the “East.”) With this choice, different periods of time were to be exhibited. The content can of course be interpreted in many different ways. The visual arts of the period heavily leans on the Ottoman culture. The publication called Fatih Albümüne Bir Bakış [A Look on The Album of Conquest], by Mazhar Şevket İpşiroğlu and Sabahattin Eyuboğlu, made the issue of Mehmet Siyah Kalem contemporary in 1954, within the parameters of art history that became increasingly academic by the end of 1940s’ Turkey. İpşiroğlu and Ettinghausen connected Siyah Kalem’s works to the worldview of the time of the conquest. Although this problem evolved into other histories and directions, it is possible to say that Ottoman culture, traditions and Mehmet the Conqueror infused the 1950s with a new self-confidence. From this perspective, film is important and a first. The two films serve as an answer to the cultural opening of two different periods of time. Another publication displayed at the exhibition that resembles an art object and is perhaps as such is a calendar, constituent of poems written against Spain during the Dutch resistance, compiled by Adriana Buning, visualized by the drawings of H.N. 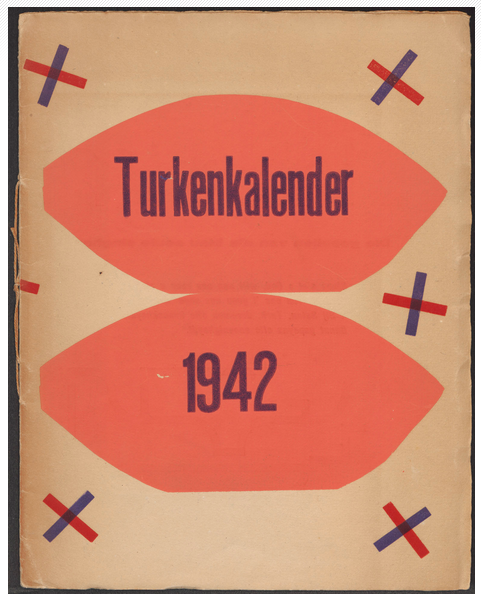 Werkman: Turkenkalendar [Calendar of the Turks], 1942, (published 1941). After the Second World War, Hendrik Nicolas Werkmen risked his life to depict what was happening in Greece, France, and The Netherlands, invaded by the Nazis, through this calendar that would enter people’s homes illegally. The calendar was published by underground press, inspired by Gutenberg’s warning of the Turkish invasion after the fall of Istanbul in 1453. The calendar included poems that were written in the past against foreign invasion. It was risky to keep his calendar at home, as it served as a code and symbol of a brave resistance. The fact that the conquest of Istanbul was still considered inspirational for countries under the Nazi invasion, the use of the Turkish calendar to have some sort of invisibility as well as an open resistance, showed that the prejudice that the European mentality had for the Turks had continued for over 500 years. This is why I think these two films are significant for the exhibition. H.N. Werkman: Turkenkalendar [Calendar of the Turks], 1942, (published 1941). RK: How did you compile the works? Were there were that you wanted that you could not get to? ZYY: Many. There are two museums in Turkey dedicated to this time period: Mimar Sinan Güzel Sanatlar Üniversitesi İstanbul Resim ve Heykel Müzesi [Mimar Sinan Fine Arts University Istanbul Painting and Sculpture Museum] and T.C. Kültür ve Turizm Bakanlığı Ankara Resim ve Heykel Müzesi [Republic of Turkey Cultural and Tourism Ministry Ankara Painting and Sculpture Museum]. To borrow works from both of these museums was almost impossible, for various reasons. Similar problems were experienced with various bank collections, due to the limited amount of time. I would also like to indicate here that SALT’s preferences and decisions on which collections to collaborate with were also decisive. This last exhibition has an art historical perspective and its problematique is quite different than a contemporary art exhibition. But, it was not possible to provide written material that would elaborate on the thoughts and perspective that delienated this exhibition to the regular viewer, opening it up for criticism. RK: We are not used to such comparative exhibitions in Turkey; or rather, we are not used to even books and talks with such an approach. I thus think that this exhibition is quite important. Are you thinking of doing a more large-scale project on this topic? Or what could be done? ZYY: I would like to do that. I hope that we can finance such a project. I’m an art historian. My curatorship (if it could be called that) is more art historical. I try to make exhibitions based on certain problematiques in art history. This is a very difficult task that requires work, time, a network and more money. It is necessary to tap into collections, rather than using the contemporary art pool. This is why we don’t see this kind of exhibitions often. RK: Is there anything you would like to add? ZYY: There is a lot that can be said on the selected and exhibited works and the process of selection. But it is impossible to answer everything. 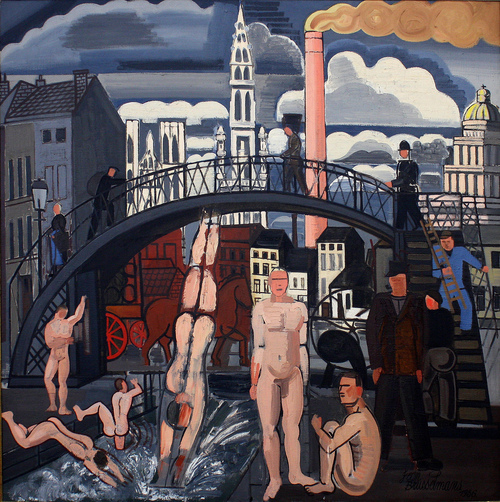 I would only like to highlight Jean Brusselmans’s Le bain des vagabonds [Vagabonds Bathing] (1936) which greets viewers when they enter the space; this is an ironic work that answers many of the questions on “modernity.” The figures are not reminiscent of children playing with water in urban fountains, it is a recognizable scene. But behind the vagabonds are factory chimneys… People passing by on the bridge, going up and down the stairs, standing still. For me, another interesting work is Theo van Doesburg’s Ontwerp monument voor Leeuwarden/Design monument to Leeuwarden [Design for the Monument of Leeuwarden] (Leeuwarden is the capital of the state of Friesland in northern Netherlands, invaded in World War II. Leeuwarden was liberated on April 15th, 1945, by the help of the Canadian military, who defeated the Germans.) This work is displayed with Andrzej Wróblewski’s Dazenie do doskonalosci/The pursuit of perfection (1952). This small-scale work takes into consideration the European Modernity’s promise of a “better future”—re-considered after WWII—both ironically and seriously: it depicts the futility of climbing the stairs to heaven. This work is reminiscent of a fragment from another South African, Jewish artist’s film—William Kentridge’s Journey to the Moon (2003). During one scene, Kentridge puts a ladder against a wall on which his works are displayed, tests the ladder, disappears as he starts climbing. The ladder is not on a stableground; while he is climbing, the front part of the wall is dangerously shaken, wobbled, the images shift and disperse. Kentbridge swerves around at an unknown height and falls behind the wall, gets up, dusts himself off, continues on his way. There is nothing preventing us from thinking that he was influenced by Wróblewski. Modern art is complicated and full of contradictions, embodying subjects, phenomena, and events, similar to the metaphor of modernity. To answer the question you posed at the beginning, I’ll say that I want to realize another exhibition that makes visible the position and uniqueness of “other” modernities in relation to the center. Posted in content, on artists and tagged Modern Times, Rumeysa Kiger, SALT, Zeynep Yasa Yaman. Bookmark the permalink.